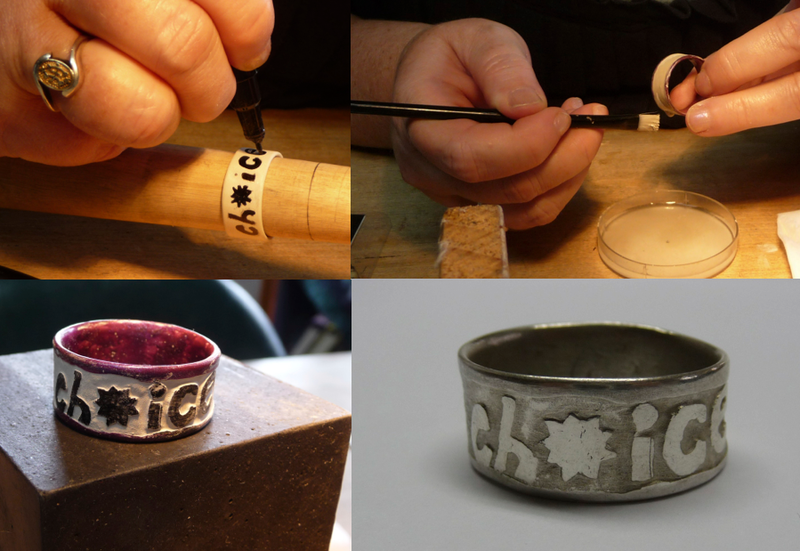 A fantastic way to create your absolutely unique silver jewellery piece is the technique called "water etching"! Any motif, in this case a word and a star, can be painted on the dried precious metal clay item. photo top right: once the paint is dry- which only takes a few minutes- you can start working on the uncovered areas by washing over them with a paint brush and water. photo bottom right: the fired jewellery piece, ready to wear. Suitable for beginners with no experience! You will learn about design aspects and acquire skills to shape, decorate, refine and finish your individual silver jewellery pieces. I was wondering what materials are you using to etch?